Guardian Headache and Pain Management Institute in Bloomington, Illinois Dr. Taimoorazy and the staff treat patients with headaches, migraines, fibromyalgia, and even cancer. By using the application of a multidisciplinary approach, it allows treatment of the physical, emotional, behavioral, occupational, and social aspects of the pain to be treated in a more effective manner. Just after your first appointment to Guardian, Dr. Taimoorazy will have a plan to make your road to recovery a fast and easy one. While being a patient you will learn everything you will need to know about pain management. Dr. Taimoorazy is the doctor at Guardian Headache and Pain Management Institute. His first name is Benjamin, he is 53 years old and has 19 years in the practice. His desire to become a doctor first came about as a child growing up seeing all of his family members as they were all practicing physicians. He loved watching them be able to help people and make them feel better, he then knew that was what he wanted to do. Dr. Taimoorazy is the 14th person in his family to become a doctor. Dr. Taimoorazy's medical specialty is anesthesiology and he also has a board certification. Although his specialty is anesthesiology, Dr. Taimoorazy has branched out into other sub specialty such as pain management and headaches. Headaches was only made a specialty around 8 years ago and he chose to specialize in the field because of how complex and misunderstood it is. Dr. Taimoorazy went to medical school in Iran and then came to the United States where he did his internship and residency at Advocate Illinois Masonic Hospital. During his years of residency were when Dr. Taimoorazy became interested in pain management. Typical patients treated by Dr. Taimoorazy are chronic pain patients. These include people who have fibromyalgia, rheumatoid arthritis, headaches, and occasionally cancer patients. During his first 13 years of practice while focusing more on anesthesiology, Dr. Taimoorazy wrote a book called Before You Go Under. he wrote it because after seeing patients every day that would ask him the same questions he noticed that they weren't as informed as they probably would have liked.The book basically answers any question you could possibly have before going under anesthesia. It is a very informative book that will definitely calm your nerves before having a surgery or procedure. Lower level laser therapy (or LLLT) can be used for a number of different conditions including joint pain and headaches. It is the application of light (low power laser) to a pathology, promoting tissue regeneration, inflammation reduction and pain relief. Treatment typically takes about ten minutes and depending on the underlying condition, should be done two or more times a week. The cervical epidural steroid injection relieves pain in the neck, shoulders, and arms that is caused by a pinched nerve, or nerves, in the cervical spine. When having a herniated disc or spinal stenosis it can compress nerves causing inflammation. The medication injected into the area of discomfort when getting this injection helps decrease the swelling of nerves. The cervical transforaminal epidural steroid injection procedure is performed to relieve neck, shoulder, and arm pain that is related to compression of a nerve root in the cervical spine. When having a herniated disc or spinal stenosis it can compress nerves causing inflammation and pain. The medication injected into the area of discomfort when getting this injection helps decrease the swelling of nerves. 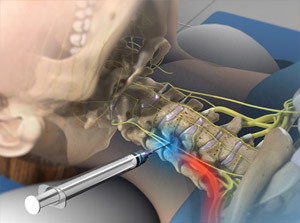 This procedure is very much like the cervical epidural steroid injection. Found on both sides of the spine, the facet joints, can become painfully irritated or inflamed. A facet joint injection can help diagnose the source of a patient's pain and it can also relieve pain and inflammation. 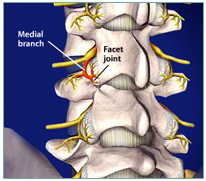 The medial branch block procedure is performed to identify a painful facet joint. The facet joints are the joints that are between the vertebrae in the spine. They allow the spine to bend, flex, and twist. This minimally-invasive procedure, that is also called radiofrequency (or RF) rhizotomy, reduces and eliminates the pain of damaged facet joints by disrupting the medial branch nerves that carry the pain signals. Cervical facet radiofrequency neurotomy is performed with local anesthetic. This procedure is much like the lumbar facet radiofrequency neurotomy procedure, the only difference is where the procedure is done at. 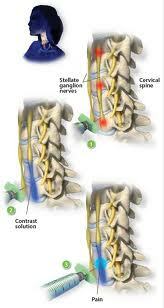 The stellate ganglion block is an injection that can both diagnose and treat pain coming from the sympathetic nerves. It's a common treatment for shingles and complex regional pain syndromes affecting the head, face, neck, or arms. In most cases a series of these injections is needed to treat the problem. Kyphoplasty is a minimally-invasive procedure that treats spine fractures caused by osteoporosis. It is designed to provide rapid back pain relief and help straighten the spine. The lumbar epidural steroid injection procedure is performed to relieve lower back and radiating leg pain. Steroid medication can reduce the swelling and inflammation caused by spinal conditions. 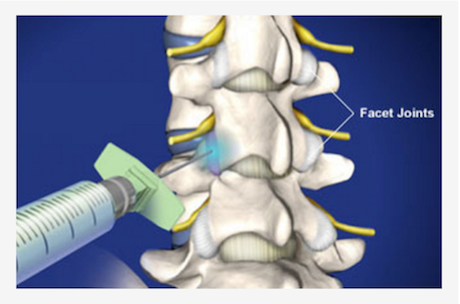 The lumbar transforaminal epidural injection procedure is an injection of a steroid-anesthetic medication. The medication can reduce swelling and inflammation of any irritated spinal nerves. This procedure is performed to relieve any pain in the lower back and pain that radiates from the back to the legs. The injection takes just a few minutes to complete. This minimally-invasive procedure, that is also called radiofrequency (RF) rhizotomy, reduces and eliminates the pain of damaged facet joints by disrupting the medial branch nerves that carry the pain signals. 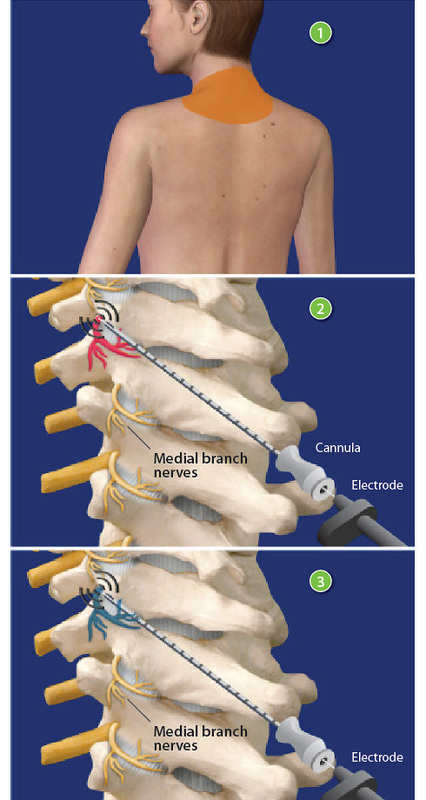 Lumbar radiofrequency neurotomy is performed with local anesthetic. The sacroiliac joint steroid injection procedure is performed to relieve pain that is caused by arthritis in the sacroiliac joint where the spine and hip bone meet. The steroid medication can reduce swelling and inflammation in the joint. This outpatient procedure is an injection of a steroid-anesthetic medication through an opening in the sacrum. The medication can reduce swelling and inflammation of irritated spinal nerves. The injection takes just a few minutes to complete.